Ismael Wonder is a charismatic African singer-songwriter with a penetrating voice and musical talents that span the guitar, flute, harmonica and n’goni. His original compositions, sung in Bambara, Peuhl, Arabic, and French, draws from the ﻿Mandingo﻿ traditions of his native western Africa, as well as ﻿Oriental, Reggae, folk and Afrobeat music﻿. Wonder's music takes us on a deeply spiritual journey through the rich and diverse confluences of Africa and Europe. His style is unique, but if one had to site sources of inspiration, they would be Ali Farka Touré (mandingo blues), Tinariwen (Touareg) and Fela Kuti (Afrobeat). When asked what style of music he plays, he answers : N’ka foli which means in bambara 'it’s my way of playing'. Ismael’s first love was reggae music, because he found in reggae the essence of African wisdom. 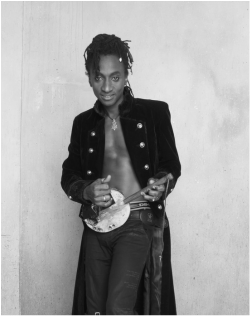 As a teenager, he started making music and in 1991, against the will of his parents, he went to Abidjan to try his luck. He recorded a first reggae album « Générations » in 1993. One of the songs of that album, « Ka Ben Kèlè Man », a song advocating the understanding between people, brought him in contact with Amadou Toumani Touré, who brought democracy to Mali and who was re-elected president of Mali in 2002. The meeting with ATT triggered Ismael's profound fascination for Malian culture and traditions. In 1996, he released a second album « Tchè té mousso té » (neither man nor woman) where he comments in a humourous way his androgynous appearance, which often leads to confusion. He toured in Côte d'Ivoire, Burkina Faso and Mali to promote the album and during this tour he met a producer who invited him to France to record « ﻿Toubi﻿ » on which Ismael mixes for the first time reggae and traditional African melodies. In Paris, he started playing guitar and in 2004, he teamed-up with a group of musicians with who he recorded the album « Pharaon », released in May 2005. In 2009 MicroKosmo produced his fifth album SOS. More recently, Wonder's music has evolved from his well-acclaimed reggae roots towards a more intimate sound that takes inspiration from his Mandingo or West African world. He is preparing the new N’ka foli album !